INTO THE NEXT STAGE: Which Shows Featuring Asian American Regulars Will Return Next Season? You are at:Home»English»Columnists»INTO THE NEXT STAGE: Which Shows Featuring Asian American Regulars Will Return Next Season? By my next column, the television networks will announce their fall line-up, and we’ll know which series got cancelled and which new ones got the green light. But it doesn’t look good for many shows featuring Asian American regulars. One of my concerns is ABC’s “The Neighbors,” about a family that moves into a neighborhood of green-scaled aliens disguised as humans. Ahead of its fall 2012 premiere, the comedy debuted to mean-spirited reviews. It was as if there was a “TV reviewer virus” that went around, affecting the laugh centers of these people, because I thought it was funny from Day One. Going against stereotypes of unattractive Asian men, Korean American Tim Jo — who played Reggie Jackson (all the aliens were named after professional athletes) — got caught in two successive love triangles with two attractive white girls. Last year after MANAA and the Asian Pacific American Media Coalition sent letters to ABC President Paul Lee urging renewal of the Wednesday night sitcom, it was saved, but moved to that “TV Graveyard Night” — Friday — where it received even less promotion. As a result, the ratings fell to a .9 in the 18-49 demographic (in my experience, if you fall below 1.5, you’re in trouble). A source on the show told me the budget of the first season was cut in half, and based on the cost vs. ratings ratio, it actually ranks highest for the night. Still, I’m already picking out my black suit for its funeral. 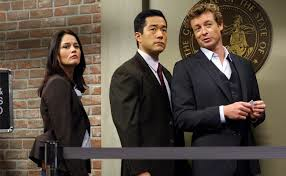 As I mentioned in a previous column, it also doesn’t look good for “The Mentalist,” featuring Tim Kang as Agent Cho. Though the Sunday cop series dropped two of its regulars, picked up two new ones, and moved operations from Sacramento to Austin for a new look, ratings have continued to fall, and the conclusion of the long-drawn out “Red John” subplot satisfied no one (and there wasn’t even a bump in the ratings for it). The Simon Baker-led show actually does better than its lead-in, “The Good Wife” (Archie Panjabi plays a law firm’s popular investigator Kalinda), which has been renewed because the critics have fallen over themselves praising the drama for its fascinating creative twists and turns and Emmy-caliber acting. Yet Warner Brothers Television, which produces “The Mentalist,” has been given the unusual permission to shop their show to other networks in case CBS decides to pass on it. Then again, there’s one program that includes an Asian American regular (Brenda Song) that I’ll be cheering to see cancelled: “Dads,” which opened with the most racist premiere in recent memory. Tim Jo caught in another love triangle on “The Neighbors” (with Megan Park & Clara Mamet). MANAA publicly asked Fox to re-shoot problematic scenes in order to avoid airing something critics hated (the show got an unheard of 0% rating on the Rotten Tomatoes website, meaning every single reviewer — 37 of them — didn’t recommend it) and that the network admitted went too far. This week, another new Fox series, “Almost Human,” got the axe. Just as well. I stopped watching after I kept seeing too many Asian American characters getting knocked off. The star threw a half-Asian cyborg cop out of his squad car (just because he was annoying him), and bank robbers killed only one hostage — threw him out of a high-rise window, for God’s sake — also Asian. Professor Mio’s Corner: Jeff Mio, former MANAA president, gives me updates on “Grey’s Anatomy,” if nothing else to confirm that nothing’s changed regarding the lack of Asian American (14% of Seattle, where the drama is based) guests vs. the unrealistic abundance of black (8% of Seattle) guest stars and regulars. He wrote on April 17: “Tonight’s episode had two more black patients, and no Asian patients. I’ve been misperceiving this show all along. I’ve been saying that if I were black, I would never move to Seattle because I have almost a 100% chance of getting in an accident or contracting a horrible disease. The only Asian regular on the show, Cristina Yang (Sandra Oh), leaves the series May 8. 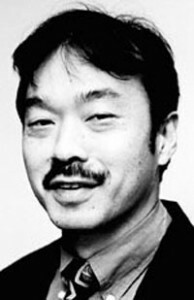 Clue to the Problem Department: Monday night, I heard “Hawaii Five-O” showrunner Peter Lenkov’s speech saying there was such a deep pool of talent in the Asian American community and that he always uses open casting to fill the roles. Hmm, I thought, that’s the problem. As I’ve told the networks, in order to reflect reality (and that’s mostly what we’re asking for) you have to keep in mind where your show takes place and the occupation of the characters. So if it’s a hospital setting and one out of every six doctors in this country is Asian, you should have a few Asian American regulars on the program. If it takes place in South Central, it won’t look real if you don’t have a lot of blacks and Latinos in the cast. Asian Pacific Islanders make up 60% of the 50th state, literally twice as much as the white population, yet you’d think it was the other way around if you watch this shameful reboot. I guess the “best actor for the role” for suspects who don’t get to say one line before being killed almost always turns out to be Asian American. Wow, we should be so proud of that! In last week’s episode, there were three American students-turned-terrorists. Two were white, one was Asian. Guess which one didn’t survive to utter one line — heck, one word — before killing himself? Yep, the Asian one (see, we’re at such a low threshold for this show, we’re not even differentiating between “good guy” or “bad guy” roles, just the right to speak!). There was a picture of a group of troops in Afghanistan — including one Asian guy — whose tank was blown up. Only one survived. Guess who lived to talk to Five-O? Yep, the white guy. Even more hilarious, he asked McGarrett and Danno how to say “thank you” in Hawaiian. The two haoles told him, “mahalo.” A laugh riot, people, a laugh riot! Where was the “played for laughs” music then? Daniel Dae Kim said he’s proud that the series has the highest number of Asian American regulars and guests (he must be counting those who appear but don’t say anything before dying) on any network show. But really, the template was set in 1968 when two of the four regulars — Kono and the character he plays, Chin Ho — were already written as APIs. And yes, the producers get credit for giving the Max Bergman coroner role to Masi Oka. But then they proceeded to add three non-API regulars when it was already overflowing with white guest stars and recurring characters vs. the dearth of non-suspects/villainous Asian guest parts. How come? I thought Lenkov said there was such a deep pool of talent within the API community? You don’t think he doesn’t see us as heroes, do you? Or “the best Asian” is one that doesn’t get the chance to talk? A real head-scratcher, that! How do you say, “What a conspiratorial mess” in Hawaiian, McGarrett? This kamaaina wants to know.